Visit Cataloochee Ski Area this season and experience Southern hospitality on the slopes. For generations of snow-loving families, Cataloochee is a winter tradition, and with good reason. Our winter playground is nestled in the Great Smoky Mountains with breathtaking views of the surrounding peaks – riding the chairlift has never been more rewarding. Smooth, gentle slopes like Easy Way and Rabbit Hill, serviced by a beginner’s chairlift, gives novices the elbowroom they need to learn the basics and practice their skills. Intermediate skiers and snowboarders find plenty of action on Rock Island Run and Lower Omigosh, while seasoned experts can face the challenge of Upper Omigosh. For skiers and snowboarders looking for a thrill, our Cat Cage Terrain Park delivers with ramps, rails and boxes. At Cataloochee, everyone in the family, skiers and snowboarders, from novice to veteran, can carve a place of their own. A child, 17 and under, will receive a free lift ticket at Cataloochee Ski Area any non-holiday Monday through Friday, with a parent purchasing a full price adult day, twilight, or night lift ticket. 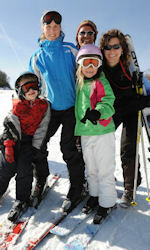 Parents must stay at a participating Haywood County accommodation to receive the voucher to be redeemed at Cataloochee. Must be 21 years old or older to qualify as a paying adult. Paying adult must purchase a full price adult lift ticket at ski area in order to use kids ski free vouchers. Offer not valid with any other discount programs. Motel portion of program offered any non-holiday Sunday through Thursday. Skiing portion of program offered any non-holiday Monday through Friday. Children must be 17 or under to qualify to receive free lift tickets. Holidays are Thursday, November 24 through Sunday November 27 as well as Saturday, December 17, through Sunday, January 1, 2012; Friday, January 13 through Monday, January 16 and Friday, February 17 through Monday February 20, 2012. Cataloochee is committed to making your skiing or snowboarding experience the best it can be by utilizing the most advanced snowmaking system in the Southeast. And as a member of the National Ski Areas Association’s Sustainable Slopes program, they are dedicated to lightening their footprint on the earth by protecting and conserving natural resources. This year, for the 2010-2011 season the folks at Cataloochee have replaced 24 snowmaking guns with new eco-efficient automatic fanguns! 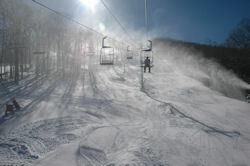 Cataloochee has also added a new six-stick automatic snowgun system on the Alley Cat Racing Trail. Automatic guns are more more environmentally sound and efficient! If sitting back and slidin’ is more your style, check out Tube World in the valley for some great Maggie Valley Snow Tubing. With the same dedication to making snow, Tube World is family fun you can depend on. Riding their conveyor lift to the top makes getting to the top of the run even easier. Don’t miss Tube World in the Valley for a slidin’ good time! After a session on the mountain, you can relax with family and friends in front of the lodge’s double-sided fireplace. There’s nothing better than swapping stories about the day’s adventures on the slopes while enjoying the lodge’s good food and an après-ski drink. You might even catch a local bluegrass band playing. Don’t forget to stop in the lodge’s gift shop to pick up your favorite Cataloochee gear before you head down the mountain. With their secluded Ski School area, Wolf Creek Hollow, and easy beginners runs, Rabbit Hill and Easy Way, Cataloochee is the perfect place to introduce your children to the magic of winter sports. All children’s instruction is carried out under the direction of our dedicated and professionally trained staff. Each instructor possesses special skills in teaching children from ages four to twelve. Cat Tracker’s (skiers ages 4-7) and Cat Explorer’s (skiers ages 8-12) and Cat Explorer’s (snow boarders ages 8-12) programs are perfect for children at all levels of ability. Call: 1-800-768-0285 or 828-926-0285 for information. Local hotels, motels, inns, cottages, and the Cataloochee Ranch are located in nearby Maggie Valley. Click on the LODGING LINK up top or visit our advertisers in the column to the right. However HERE is some new information about Cataloochee Ranch! Skiing (and staying) At Cataloochee Has Never Been Easier. Book an Exclusive No-Hassle Snow Package. Call 800-868-1401.